President Abdulla Yameen has called on the residents of islands with small populations to migrate to the new youth city to be established in Hulhumalé, stating the government is unable to meet the socio-economic needs of small islands. 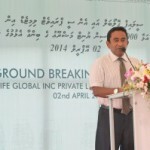 Speaking at a ceremony to inaugurate the second reclamation phase of Hulhumalé on Thursday (January 15), Yameen assured youth the government would provide better living conditions and job ‎opportunities in Hulhumalé. “The government is finding it difficult to cater to the economic and social needs of small islands. We have to meet human needs such as constructing harbours, establishing schools and hospitals, reclaiming land, transport systems, and so much more. It is not easy for the government to do this,” he said. Although the government would facilitate relocation, migration would not be compulsory, he said. In November the Majlis’ budget committee passed a proposal requiring the government to formulate a master plan for population consolidation, while the Maldives Monetary Authority recommended such a policy in order to “reduce state expenditure and provide services to the public in a sustainable way”. With the completion of the second phase of Hulhumalé development, the government hoped to increase the population on the artificial island from 40,000 to 220,000, and increase the population of the Malé region to 400,000, the president said. According to the 2014 census, the population of the Maldives stands at 341,256. Of this, 133,019 people live in Malé. The second phase involved reclamation of 240 hectares of land and is expected to be completed within two months. The US$50 million project was awarded to Belgium’s Dredging International NV. Yameen said on Thursday evening that the government would begin work on a bridge connecting Malé and Hulhumale this year, and will also improve ferry services. The president has previously pledged to establish a ‘technopolis park’, entertainment, and sports facilities, and facilities for tourism and fisheries industries. Hulhumalé Development Corporation officials have also said phase two of the project will feature a monorail to Ibrahim Nasir International Airport. Yameen said he had received a petition signed by 85 percent of residents in Vaavu Atoll Fulidhoo Island requesting relocation. To facilitate economic activity and ease population pressure, the government will allow buildings to be built as high as 25 stories in Malé and Hulhumalé, the president added. Studies have shown the land in Malé to be strong enough, he said. At present, buildings in Malé can be constructed to a maximum of 15 stories. Yameen also pledged to ban traffic in narrow lanes in Malé in order to ease congestion and to allow space for children to play. Speaking at the ceremony, tourism minister Ahmed Adeeb said Yameen is the only political leader in the country with the courage to provide opportunities for youth. The government will develop the northern and southern regions through the Special Economic Zone Act, pledged Adeeb. The road development project in Laamu Atoll, the airport in Kulhudhuffishi and the I-Havan port in Haa Alif will create more opportunities for the youth, he said. If the government finds it very "difficult" and does not know how to let people live in their own islands and provide essential services, then the government should resign and let someone else do the job! Yameen is now admitting his own failures. Creating a hugely congested shanty town in Hulhumale is not the solution to this issue. Who is going to bear the associated social costs of such a migration? The Male area is already suffering from steep rises in crime, drug use and poor quality of life for most inhabitants. Yameen and other rich folk can get away to Singapore on a regular basis to "relax", but most of us cannot do that. We like our beautiful island and the quality of life there. There are many ways in which essential services can be brought to these beautiful islands. The government has run out of ideas! "Speaking at the ceremony, tourism minister Ahmed Adeeb said Yameen is the only political leader in the country with the courage to provide opportunities for youth." Sure he's got courage, but exactly what opportunities have been provided for the youth? Care to spell out a few? To be honest, Hulhumale is the most practical way for population consolidation. Yes, small islanders should be INCENTIVISED to migrate to HM. If you are bothered about high rent and prices, you ain't seen nothing yet. Emptying out the small islands will make more islands for new resorts! Please, please, please we do not need an extended Hulhumale Dump. This is our most frequent complaint of our Guest House / Hotel guests. We must start cleaning up now or this ugly site will continue. Enforced relocation is just what the Nazi party did to the Jews in Europe and what the Japanese did to ethnic Asian communities during WW2. It was a way of controlling those who didn't comply with the ideology of those in power, before they destroyed them. Hah. Not happening. I'd rather stay in the islands because the moment a bunch of armored thugs and Male'ites make landfall, a general alert can be sounded in minutes. funny, What is really given to the youth. Did anyone see what has really done for the betterment of the youth in this country. Only big shows with big banners. To be honest youth does not have even very basic rights. Look at the road to see how the government is treating the youth. Just a showing off theory which is really applied to the public by this government. 85% or even more from an island like Vaavu Fulidhoo will have no alternative to survive and grow. Plan over plan, or speech after speech promising heaven on earth is not going to relieve pressure that is burdened on socioeconomic factors of the current situation in Male' or Hulhumale! Pursuing practical reality and achieving it will be the way to any solution.